You can use OneLogin to prompt users to accept your terms and conditions before they use OneLogin. Users will be prompted to agree to the terms and conditions after their first login attempt and whenever you update the terms. You use policies to enable and provide the terms and conditions content. This gives you the flexibility to offer different terms to different user groups. For example, you can create locale-based groups and use them to provide localized terms targeted to each locale. Or you can skip the terms and conditions requirement entirely for some groups. The terms and conditions prompt is bypassed when authentication requests come from the OneLogin API, a RADIUS device, or VLDAP. Log in to OneLogin as an admin. Go to Settings > Policies. Click the New User Policy button to create a new policy, or select an existing policy from the list. On the Sign In tab, enable Require users to agree to Terms and Conditions. 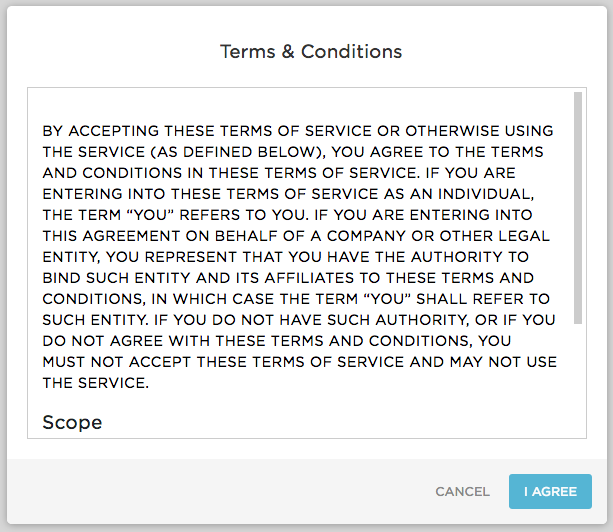 In the edit box that appears, enter the terms and conditions text that you want users to see. You can use Markdown to format the content. Any language that reads left-to-right is supported. Add users to the policy. You can either add users one-by-one or add the policy to a OneLogin Group. If you're providing different terms and conditions for different audiences, we suggest that you define a group for each audience and create a policy for each group. For example, you can create a different group for each locale that you support and create language-specific policies to assign to those groups. For more information about assigning policies to users and groups, see "Assigning a Policy" in User Policies and Groups. You can view these events at Activity > Events, and you can go to Activity > Reports to create custom reports that reference these events. You can also go to Activity > Notifications to create notifications that are triggered by any of these events.